Religion plays an important part in the lives of the people in India and even in ancient India, temples were the hub of life focusing not only on the moral and spiritual development of the individual but also as the social and educational centre of the land. The structure of the Hindu temple was rooted in Vedic traditions and they reflected the values, beliefs and traditions of Hinduism. Every temple has all the cosmic elements namely fire, earth, water, sound and ether present in them reflected in the images, bell sounds and incantations, smells of incenses, camphor and flowers amalgamated with nature and images of deities. Chhatisgarh is one of the states of India which has many forts, historical sites and temples with ancient heritage and rich culture. One of the most famous temples of Chhatisgarh is the Bhoramdeo temple dedicated to Lord Shiva in Bhoramdeo in Chhatisgarh. It is located amidst the scenic surroundings of dense forests and the Maikal mountains in the Dakshin Kosala region of Chhatisgarh. This temple is dedicated to Lord Shiva on the banks of the River Sakri and was built in the period between 6th and 12th century during the Kalachuri period and is known as the ‘Khajuraho of Chhatisgarh’. This is because its architecture with sensuous sculptures is similar to that of the Konark Sun temple and Khajuraho in Odisha. It is said to have been built in the year 1349 by Kings of the Nagvanshi dynasty who ruled the land of Chhatisgarh during that time. It was called Bhoramdeo as the Gond tribals who lived at that time referred to Lord Shiva as Bhoramdeo. The temple has been described as ‘scintillating poetry in stone’ and is a special attraction for tourists who are interested in history and archaeology. It reflects the architectural mastery of the craftsmen of that period. A colourful arch and a sculpture of Nandi, Shiva’s bull greets the visitors into the temple complex which has a broad avenue planted with giant Sal, bamboo and Arjuna trees at the entrance. There is a manmade lake with a fountain at the centre with boats moored to a jetty and on the banks of this lake is situated the temple complex. A Gulmohar tree with beautiful flowers is present on the side with the Maikal Mountains forming a beautiful backdrop. The exterior walls of the temple have a profusion of carved images. The architecture is unique as the top part of the temple tower has tiers or receding rows placed successively upwards. The first stage of the temple is a large 5 ft high platform with sculptures of Hindu deities carved on its exterior faces. Over this platform, the temple is built in the traditional style with a Mandapa or hall followed by a passage leading to the Sanctum Sanctorum or Garbha Griha. Lord Shiva in the form of a Shiva Linga is deified in the main enclosure of the temple. There are four main pillars supporting the Mandapa along with other pillars at the peripheries. The entry door is at the Eastern side with two more doors opening to the North and South. There are open half shelters at the three doors. Apart from the images of Ganesh and Shiva, there are beautifully sculpted images of the ten Avatars of Lord Vishnu right at the entrance of the Sanctum Sanctorum. The towering roof of the Garbhagriha has the circular Kalasha at the top. The main tower is surrounded by many small towers. The doorpost of the front entrance of the temple has images of Yamuna and Ganga sculpted on it. The inner and outer walls of the temple have sensuous sculptures of the Kama Sutra along with those of elephants and lions, Vishnu and his incarnations, Vishnu and Lakshmi on Garuda, Shiva and Ganesha along with that of a King and Queen. The Gods are carved from black stone while the other sculptures are carved from ochre stone. A serpent with raised hood is inside the sanctum sanctorum next to the Shiva Linga. An exquisite image of Ganesha with six arms is crafted on the Southern face of the Shikhar or tower. Images of mythological figures are on either side of the entrance doors. Adjoining the main Bhoramdeo temple is the Istaliq Temple which was built with burnt clay or dried bricks in the 2nd or 3rd century. This temple is not in a very good condition and only the sanctum sanctorum with a sculpted Shiva linga, images of Shiva and Parvati along with those of the King and Queen in a worshipful pose and a few sculpted pillars are present here. There is a west facing temple located a short distance from the main temple called Mandwa Mahal which is built like a marriage pandal or Mandwa in local dialect in memory of the wedding of the King and Queen of that time, Ramchandra Deo and Haihawanshi Rajkumari Ambika Devi. A Shiva linga is deified here with the image of Nandi offering prayers. 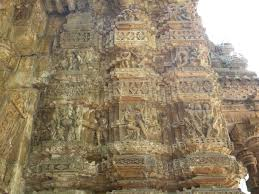 The external walls of the temple have sensuous images as depicted in the Kama Sutra. The last temple in the complex is the Cherki Mahal which is situated in a thinly forested area of the complex and not easy to locate. The roof and porch have aesthetic patterns with a Shiva linga in the sanctum sanctorum. Within the temple complex is a large Open Air Museum with a large collection of antiquities of that period displayed there. This three day festival is celebrated in the last week of March in the temple complex which comes alive with colour, gaiety and performances of folk dances, music and dance dramas. Air – The nearest airport is Raipur which is the capital of Chhatisgarh and is at a distance of 134 kms from the temple. Rail – The nearest railway station is Raipur which is on the Mumbai Howrah main line. Road – The nearest town to the temple is Kawardha which is at a distance of 18 km and has bus and taxi facilities and is connected to all major cities and towns. There are many hotels at Raipur to suit various budgets of the pilgrims. There is accommodation also available at the Bhoramdeo Jungle Retreat which is the nearest resort to the temple. The natural diversity and rich cultural heritage of Chhatisgarh with temples, monuments, forests and palaces attract tourists from all over the world. There are many famous temples where pilgrims visit to soak in the spiritual ambience of the place. The temples display the four important principles of human life namely Dharma, Artha, Kama and Moksha and pilgrims gather there especially on holy and festive occasions to spend time away from the vagaries of daily life to meditate and contemplate on the various deities in their search for peace and bliss. The architectural dexterity and skill of the artisans of the temple complex enthral tourists who commemorate the glory and culture of India.